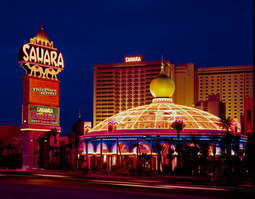 Citing financial hardship, the Sahara casino in Las Vegas recently announced that it will close its doors on May 16, 2011. The 49-year-old property has 1,720 hotel rooms and 85,000 square feet of casino floor space. The casino has two main restaurants in the House of Lords Steakhouse and NASCAR Cafe, a place famous for its six-pound burrito. Overall, the closure will affect about 1,050 employees, though the property is working with casino partners to relocate some of the workers elsewhere on the strip. Sam Nazarian, CEO of the SBE Entertainment Group, which owns and operates the Sahara, left open the possibility for a future reopening. Many of the workers were clued in to the property’s impending closure years ago. In 2009, the Sahara was forced to shut down two of its three hotel towers and its buffet, due to slow business. The Sahara is just another on a long list of trouble properties on the north side of the strip. The New Frontier casino was imploded in 2007 and is now the site of a vacant lot. The Echelon Resort project, which replaced the Stardust, has stalled due to mounting financial concerns for Boyd Gaming. The partially completed Fontainebleu Resort was forced to auction off its furnishings in 2010 and the Riviera Hotel and Casino has since filed for bankruptcy.